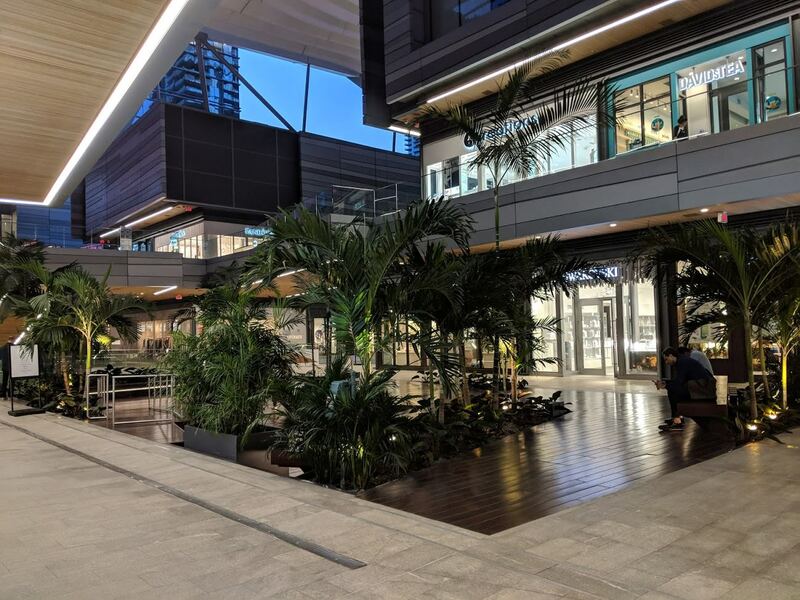 It is almost two years since the retail shops at Brickell City Centre opened, and a major investor will soon have an option to cash out. Swire Properties owns 59.25% of the mall. Simon Property Group owns 25%, while Bal Harbour Shops owns 15.75%, the report states. Bal Harbour Shops has an option, exercisable from the second anniversary of the grand opening of the shopping center, to sell its interest to Swire, the company said last month. Grand opening took place on November 3, 2016. 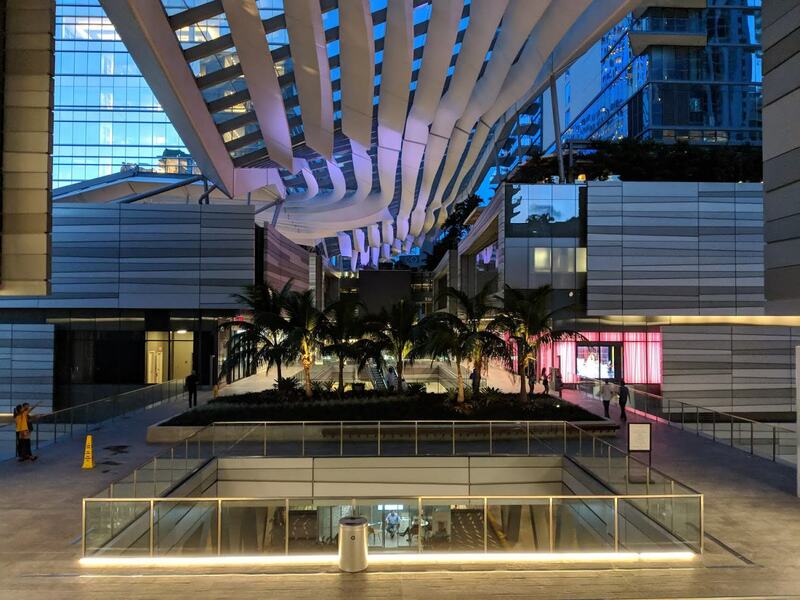 As of June 1, 2018, 80% of shops in the mall were opened, according to Swire’s most recent investor report. 89% of the mall was considered occupied as of the same date, taking into account executed leases and letters of intent. Brickell City Centre’s first condo tower, Reach, opened in April 2016. The East hotel opened in May 2016. The property is beautiful but I feel there’s a whole lot of nothing going on. Needs more restaurants and bars as opposed to overpriced niche shops. Maybe a high end bowling alley or something of that nature. Had lunch at Pubbelly Sushi today….packed as always. You are right, they could use more and different food options. The President of Swire USA said the one and only regret was not opening more restaurants sooner. So here is my opinion on this Mall. For the last 2 years there has been a person on this site going on and on about BCC needing air conditioning, at first I found him/her annoying and ignored him/her, then I cracked on his/her comments. Until finally I had a client meet us there for lunch. She arrived in an outfit probably costing a few thousand dollars dripping wet with sweat even though she had taken an Uber, and so was I and for me that was going from the Metromover to the Restaurant. She was so annoyed that our meeting went south really fast. The heat and the humidity are unbearable! Now I am not here to suggest enclosing the mall but at least the owners should invest in some fans or something. This is Miami for crying out loud and it is Summer from April through November. Do something! Because if you don’t you will continue to lose customers. You lost me from ever going back to meet clients there. And by the way my apologies to the man or woman who kept whining about the A/C, you were right and I was wrong. I stand corrected. While true, do you think that’s what BCC wants? We live in Miami… you can expect heat/humidity in an open-air mall during the summer months. You can also expect the open air mall to place fans for the comfort of their patrons. Well seat inside as we all do in Miami when the heat is unbearable…it is not the mall’s fault. We did sit inside. Did you not read my entire comment?? The problem was going from the garage and the Metromover to the restaurant – that was unbearable. It is not impossible to make it better, my good friend just moved to Panorama and their parking lot has fans on every floor making it comfortable when you walk from your car to the elevator. Problems have solutions if you take the time confront them. Ok, buy a big bubble with AC so you can survive in Miami…solution when you confront your OWN problem. Was she really fat, or from a cold climate? I walked there in a black suit and tie. Hot? Y es. Very hot on the sidewalks, yep. But I dined inside Pubbelly, it was cool and life was just fine. Some stores and most restaurants are doing very well. The Center needs to get lower priced stores. I’m at this mall at least three times a week. Other than Apple, Pandora, and Sephora I never see any of the other stores do any business. Bruno Magli has already gone and I read online that a couple of the restaurants are behind in their rent. There are too many European high end apparel stores that nobody outside of Paris or Rome has ever heard of. They need to replace these stores with lower priced mall staples. Not discount stores like Rainbow but stores like J Crew or Madewell. Maybe an Anthropologie or a CB2 instead of that store selling Baccarat and Fornasetti which I have yet to see a customer in in two years.. If you visit Bal Harbour Shops, all you see are people with a ton of shopping bags. Whenever I am at BCC (about only 4 times a month) I never see people with bags. Just lots of people eating / drinking coffee. BHS is a niche that is totally unique (like the 1%-ers). BCC is still getting its legs. I guess its whatever their expectations are. And, its location begs for neighborhood foot traffic as driving is pretty scary with an oddly planned parking garage. There is far more wealth and density within a 1 mile radius of BCC than Bal Harbour Shops. As for two big Italian food halls? I would be fine if Le Centrale was repositioned. Not a fan. Unfortanetly stores like J Crew are not doing well and are not in expansion mode. I think a bit higher end than a JCrew is fine, but a lot of he stores are too specialty. Restaurants are always packed. Luke’s Lobsters, passion De Cielo, Dr. Shmood, are always packed. Sephora, Zara, and Sax have been very busy each time I’ve been to BCC(about 6-8 times per month). The high end stores only need a handful of customers to cover costs. Top attraction in Brickell.. I would hold stock.. Center is expanding for a reason. They need more “experience retail” (ie Amazon-proof retail) stores and less “goods retail” stores. And for goodness sake, they need a way to completely entomb the entire place inside with nuclear powered A/C in the summer time (it can go back to being outdoorsy in the winter, but man the summer). You’d think a company from Hong Kong of all places would know that. I’ve been to the mall they have in hong kong and its enclosed and wasn’t that crowded other than the movie and restaurant part and two cheap stores. Correct on knowing humidity. HK is even more humid than Miami. Their projects in HK (they have at least two, Pacific Place on the island and Festival Walk in Kowloon) are all enclosed. Maybe, the climate ribbon is not working as expected? I dont feel breezes when I am in BCC. Its not uncomfortable, but Ive yet to feel a breeze. I repeat…the best performing mall I the USA is Bal Harbour…it has been a leader for at least 20 years. What “experience” shopping do they have? I get it, …the ICSC Magazine and ULI cigarettes all talk about the only way to save retail. Fact is, luxury is thriving. There has not been a single guest that I have taken to BCC that has not been flabbergasted by the experience at BCC. Some world traveler friends, if not impressed by the structure itself, are impressed by how fast Miami catching and surpassing major world cities. the question is…at what price? I would. The center has had a difficult time reaching full lease up and until Swire lowers its expectations and doesn’t let Bal Harbors associates fill it with unrealistic international stores that wont work the center wont reach its max NOI. Time to sell. I don’t think that 90% occupancy on the two year anniversary is bad. Especially at $300 per sq ft rents. Probably doing better than Merrick Park and many Malls across the country.. I think about the A/C option, in this beautiful city we cannot wear extravagants outfit, just light breathable fabrics like LULULEMON STYLE. Mall it’s fine just need a lit bit more time to be better. Kinda of Ceiling Fans could be great. Any dispossession that does not include a climate ribbon is nonsense. I spend a lot and often at BCC. Wearing black suits in the daytime, and whatever on weekends. Unless, like today, you stand in the sun on the bridge over Miami Ave. unprotected by the ribbon, I find it to be comfortable. Tonight at Sugar, there was a young thin guy sweating like crazy…so I know it takes time acclimating to warm/humid Miami weather…and it’s not for everyone.